"ELLX" redirects here. For the London railway engineering project, see East London line extension. Luxembourg Airport (IATA: LUX, ICAO: ELLX) is the main airport in Luxembourg. Previously called Luxembourg Findel Airport due to its location at Findel, it is Luxembourg's only international airport and is the only airport in the country with a paved runway. It is located 3.25 NM (6.02 km; 3.74 mi) east of Luxembourg City. In 2018, it handled 4.04 million passengers. By cargo tonnage, LUX/ELLX ranked as Europe's fifth-busiest and the world's 28th-busiest in 2010. Luxair, Luxembourg's international airline, and cargo airline Cargolux have their head offices on the airport property. The airport was originally known as "Sandweiler Airport", and was opened in the 1930s as a small grass airfield with a relatively short, 3,400 ft (1,000 m) runway. Neutral Luxembourg was invaded by Germany on 10 May 1940, and on 21 May the Luftwaffe assigned Jagdgeschwader 53 (JG 53), a Messerschmitt Bf 109 fighter unit, to the airport. JG 53 was engaged in combat against the French and British Expeditionary Force in France during the Battle of France in May and June. In addition, Jagdgeschwader 52 (JG 52) operated Bf 109s from Sandweiler during the Blitzkrieg. JG 52 moved into France on 29 May but JG 53 remained in Luxembourg until 18 August when it moved closer to the English Channel to take part in the Battle of Britain. Sandweiler Airport then remained unused by the Luftwaffe until September 1944, when Aufklärungsgruppe 123 (AKG 123), a reconnaissance unit which flew the Henschel Hs 126, a two-seat reconnaissance and observation aircraft, was assigned to the airport. AKG 123 moved east into Germany after only a few days when the United States Army moved through Luxembourg and cleared the country of the occupying German forces. United States Army combat engineers arrived at Sandweiler in mid September 1944 and performed some minor reconstruction to prepare the airfield for Ninth Air Force combat aircraft. The airfield was designated as Advanced Landing Ground "A-97" Sandweiler and was opened on 18 September. The Ninth Air Force 363d Tactical Reconnaissance Group operated a variety of photo-reconnaissance aircraft until 29 October 1944 when they also moved east into Germany. Sandweiler Airport was used by the Americans for the rest of the war as a transport supply airfield and also to evacuate combat casualties to the UK. It was returned to Luxembourgish control on 15 August 1945. Luxembourg Airport has constructed a high-security zone far away from most airport activities in order to attract the business of transporting valuable goods such as art and jewels. According to Hiscox, there is a "massive demand" for such a hub for precious cargo. Planes taxi away from main airport facilities before loading. In 2015, the airline with the largest share of the airport's total passenger volume was still Luxair with 1.69 million passengers at a 63% share. Built in 1975, the building was the only terminal of the airport for 30 years, until terminal B opened in 2004. The terminal was getting overcrowded especially during the summer period, and only contained two or three shops. The terminal started to be demolished at the end of 2011 and was complete by March 2012; this was in order to make way for a footbridge connecting terminal B to the new terminal A. Construction of the new Terminal A started in 2005 and it was inaugurated in May 2008. Terminal B opened in 2004, the building is unique as it only has gates and no check-in counters or arrivals hall. It was built for small planes with a maximum capacity of 50 people. It can handle up to 600,000 passengers a year. The Terminal reopened in the summer of 2017 after some arrangements to handle aircraft with a capacity of up to 80 passengers. It is mainly used by Luxair's Q400 fleet. On 22 December 1969, Vickers Viscount LX-LGC of Luxair was damaged beyond economic repair when it ran off the runway and the nose wheel collapsed. On 29 September 1982, Aeroflot Flight 343 suffered a runway excursion on landing at Luxembourg Airport. On 6 November 2002, Luxair Flight 9642, Fokker 50 (registration LX-LGB) was incoming from Berlin, Germany, and crashed in a field near the village of Niederanven during its final approach to Luxembourg Airport. 20 passengers and crew lost their lives, including artist Michel Majerus. On 21 January 2010, Cargolux Flight 7933, operated by Boeing 747-400F LX-OCV struck a vehicle on landing. The van suffered major damage and the aircraft sustained a damaged tyre. ^ "Aeroport De Luxembourg Mouvements" (PDF). Archived from the original (PDF) on 2014-03-13. ^ "Luxembourg airport recorded passenger increase in 2018". Lux-Airport s.a. 18 January 2019. ^ "Legal." Luxair. Retrieved on 7 February 2011. "Luxair S.A. LuxairGroup Luxembourg Airport L-2987 Luxembourg." ^ "Network & Offices Luxembourg Archived 2011-07-08 at the Wayback Machine." Cargolux. Retrieved on 15 May 2010. "Cargolux Head Office Luxembourg Airport L 2990 Luxembourg"
^ a b "The Luftwaffe, 1933-45". Ww2.dk. Retrieved 1 June 2015. ^ "IX Engineer Command". Ixengineercommand.com. Retrieved 1 June 2015. ^ Michaels, Daniel (19 February 2013). "Gunmen Waylay Jet, Swipe Diamond Trove". Wall Street Journal. Retrieved 20 February 2013. ^ "Air travel: lux-Airport expects 6 percent growth, new destinations in 2016". 8 January 2016. ^ L'essentiel. "Le terminal B du Findel rouvrira pour l'été 2017". ^ "Timetable - Flight Information - Luxembourg Airport". Lux-airport.lu. Retrieved 23 February 2019. ^ a b "Luxair plans new European markets in S19". routesonline.com. Retrieved 27 September 2018. ^ Ranter, Harro. "ASN Aircraft accident Ilyushin 62M CCCP-86470 Luxembourg-Findel Airport (LUX)". aviation-safety.net. Retrieved 2017-04-03. ^ "Incident: Cargolux B744 at Luxemburg on January 21st 2010, touched van on runway during landing". Aviation Herald. Retrieved 23 January 2010. Luxair Flight 9642 was a scheduled international passenger flight flying from Berlin Tempelhof Airport, Germany, to Luxembourg Findel Airport, Luxembourg. The flight carried 19 passengers and 3 crew members. The flight was operated by Luxair, the flag carrier of Luxembourg. The plane was a Fokker 50 and registered as LX-LGB. Lufthansa had a codeshare on the flight as LH2420. On 6 November 2002, the flight crashed while on final approach to Luxembourg Findel Airport about 6 nautical miles (11 km) short of the runway while trying to land in fog. 20 out of the 22 passengers and crew perished. Maastricht Aachen Airport is a regional airport in Beek, Netherlands, located 5 NM northeast of Maastricht and 15 NM northwest of Aachen, Germany. It is the second-largest hub for cargo flights in the Netherlands. As of 2016, the airport had a passenger throughput of 176,000 and handled 60.000 tons of cargo. Shah Amanat International Airport is an international airport serving Bangladesh's southeastern port city of Chittagong. Operated and maintained by the Civil Aviation Authority of Bangladesh, it is the second-largest international airport in Bangladesh after Shahjalal International Airport in Dhaka, Bangladesh. It is used by the Bangladesh Air Force as a part of 'BAF Zahurul Haq Base'. It was formerly known as MA Hannan International Airport, named after Awami League politician M. A. Hannan, but was renamed on 2 April 2005 by the Government of Bangladesh, after an Islamic saint, Shah Amanat. It is capable of annually handling 1.5 million passengers and 6,000 tonnes of cargo. SAIA also serves as a base to Arirang Flying School. Sandweiler is a commune and town in southern Luxembourg. 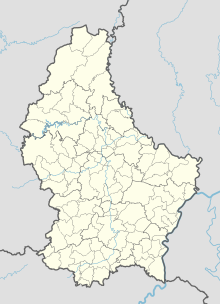 It is located 5 kilometres (3.1 mi) east of Luxembourg City. Piarco International Airport, and frequently shortened to Piarco International, Piarco Airport, or simply Piarco, is an international airport serving the island of Trinidad and is one of two international airports in Trinidad and Tobago. The airport is located 30 km (19 mi) east of Downtown Port of Spain, located in the adjacent town of Piarco. It is the seventh busiest airport in the Caribbean in terms of passengers served and third busiest in the English-speaking Caribbean, after Sangster International Airport and Lynden Pindling International Airport. The airport is also the primary hub and operating base for the country's national airline, as well as the Caribbean's largest airline, Caribbean Airlines. Manas International Airport is the main international airport in Kyrgyzstan located 25 kilometres (16 mi) north-northwest of the capital Bishkek. Saarbrücken Airport, or Flughafen Saarbrücken or Ensheim Airport in German, is a minor international airport in Saarbrücken, the capital of the German state of Saarland. It features flights to major cities throughout Germany as well as some leisure routes. Lionair was a Luxembourg-based passenger airline that operated from 1988 to 1990 as a joint venture of Cargolux and Luxair. Cargolux Flight 7933 was a cargo flight which was involved in a serious incident on 21 January 2010 in which it landed on a vehicle that was on an active runway. The vehicle suffered major damage while the aircraft had damage to a tire. Three investigations were launched into the incident. The cause was found to be errors by Air Traffic Control.